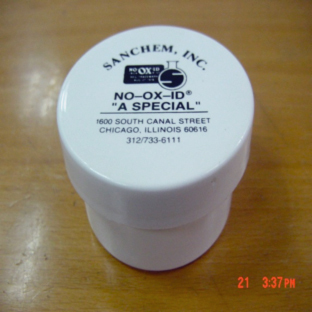 Buy NO-OX-ID A-Special Grease Direct from Sanchem! NO-OX-ID "A-SPECIAL Electrical Grade" is the electrical contact grease of choice for new electrical installations and maintenance. NO-OX-ID electrical contact lubricant (electrical contact grease) is an electrically conductive grease that keeps metals free from rust and corrosion. This electrical contact grease has been used in the power industry for over 65 years to prevent corrosion in electrical connectors from low micro-power electronics to high voltage switchgear. NO-OX-ID A-Special is RoHS compliant! This product is also used as a battery terminal grease. 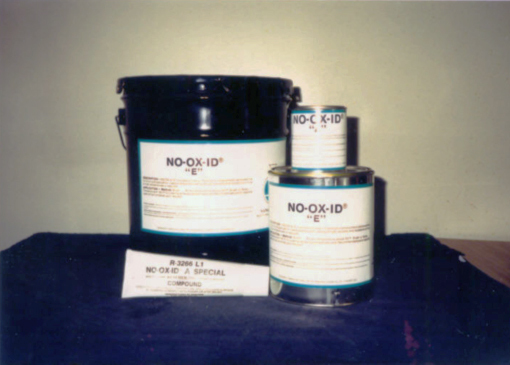 Click here to download more information about NO-OX-ID "A-SPECIAL Electrical Grade"
NO-OX-ID electrical grease prevents the formation of oxides, sulfides and other corrosion deposits on copper, aluminum, and steel surfaces and conductors. The purpose of an electrical contact lubricant is to prevent corrosion and lubricate the connection for easier maintenance. NO-OX-ID "A-Special" electrical grease prevents corrosion attack on all metal surfaces. Attack can come from battery acid, salt, moisture and various industrial chemical vapors in the environment. When this conductive paste is used on aluminum connectors in joints, NO-OX-ID "A-Special" prevents the reformation of oxide films, which cause high resistance and subsequent failures. It is a great choice for a battery terminal grease. NO-OX-ID A-Special electrical conductive paste is recommended by connector manufacturers for trouble-free joint connections. It is also used as a battery terminal grease. When nuts, mounting bolts, and cotter keys are coated with NO-OX-ID "A-Special", they will never rust or freeze assuring you easy, trouble-free removal. NO-OX-ID "A-Special" should be used wherever the formation of a corrosive product will affect the proper functioning of the metal surface. This electrical contact grease is easily applied, easily removed, and gives long lasting reliable performance even on dissimilar metals. Practical Sailor Magazine December 2010 (Consumer Reports for Sailboats) tested NO-OX-ID electric grease and terminal grease lubricant on electrical terminal connectors. They tested the electrical contact grease and electrical terminal lubricant for 1 year in a salt water chamber which is the torture test of wire, crimp connectors and corrosion inhibitors. Their conclusion was that NO-OX-ID electrical grease outperformed all other greases, lubricants and corrosion products tested including Boeshield T-9®. According to the Practical Sailor testing, all sections treated with Boeshield T-9® had completely rusted over. “There is only one product choice for long term corrosion performance as an electrical grease and terminal lubricant. The electrical grease NO-OX-ID was the only product to provide lasting protection on terminals, the best value in consideration of the small amounts used and the cost of troubleshooting problems. It is worth paying more for a better coating”. Apply a thin coat of this electrically conductive grease to mini-lamp bases before inserting into sockets. Apply to base of lamp socket and lens contact area. Apply to all electrical conduit connections by packing the end of the tubing and nut before connecting to box connection. Apply to all wire terminal connections and wire splice connections. Dip the spade or ring into the NO-OX-ID. Apply to all electrical junction box connections or terminal posts in light system, starter cable connections, alternator terminal connections, battery posts connectors and ground connections. Apply a thin coat of this electrically conductive lubricant to 7-way trailer plug connections and VW cable connector. Use NO-OX-ID A-Special as a battery terminal grease to prevent battery corrosion for your car battery maintenance and marine battery maintenance. For battery connections coat the post, screw, clamp, and terminal liberally with NO-OX-ID. A little NO-OX-ID goes a long way! When splicing aluminum cable with compression-type connectors, brush NO-OX-ID A-Special to the inside surfaces of the connector. Using a wire brush, brush these inside surfaces thoroughly with the A-Special coating. This roughs up the surface assuring positive contact. 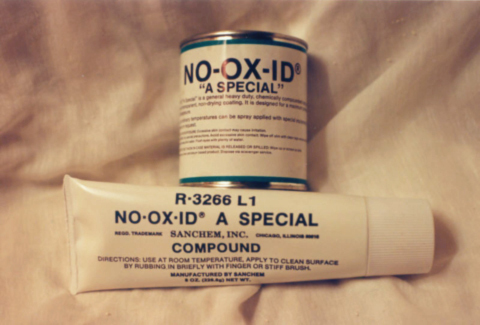 At the same time, the NO-OX-ID A-Special is providing protection against the oxide film, that can occur in the short space of time between roughing up the surface and final connection. Apply a thin coat of NO-OX-ID A-Special to cable ends to complete the splice to prevent aluminum rust. Does electrically conductive grease increase conductivity? Many electrical contact greases have copper, zinc or other metals blended into a grease to increase conductivity. In a study for an aerospace company in 1985 it was concluded that putting metal into grease does not help conductivity. In many cases it reduces conductivity. 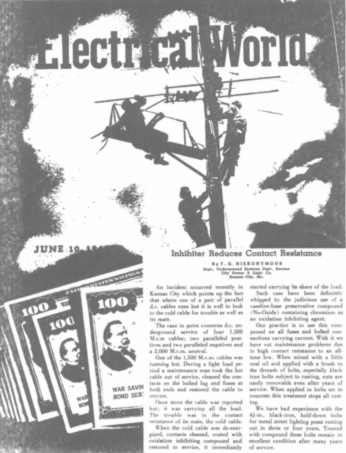 The United States Department of the Interior Bureau of Reclamation states in their Facilities instruction Journal Volume 3-3 Electrical Connections for Power Circuits in section 6.3.2 that, "Use of grease with embedded zinc particles will cause a poorer connection due to the lower conductivity of zinc". Aluminum Oxide is one of the hardest substances known to man, just softer than diamonds. Zinc is not able to cut or dissolve aluminum oxide either. 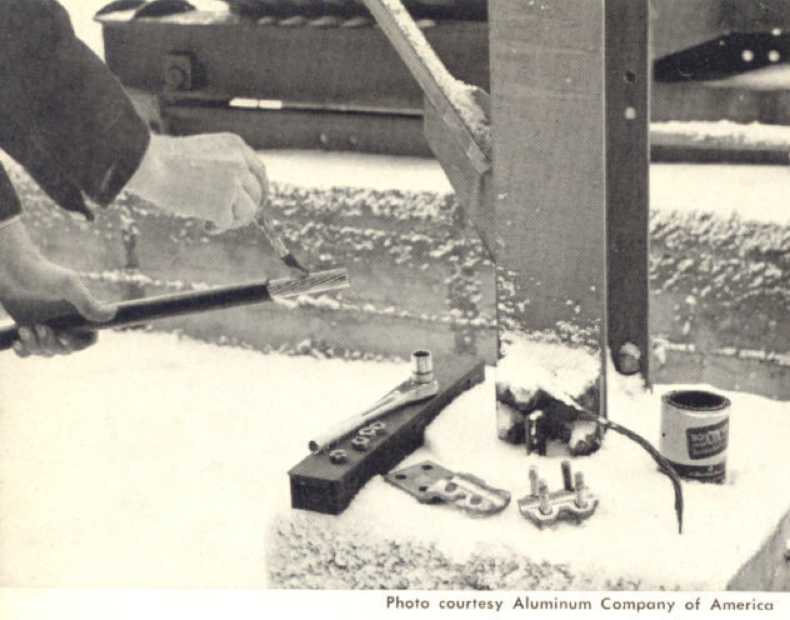 The aluminum oxide that typically forms on an aluminum connection is only 50-120 angstroms thick. Sanchem's NO-OX-ID penetrates the oxide film by the chemical action of our corrosion inhibitor system. NO-OX-ID is not a grease that can be washed off and breakdown in the presence of water or acid, it is a moisture and corrosion resistant rust preventive compound. Why should you use NO-OX-ID A-Special on your battery terminals? NO-OX-ID prevents the premature death of your battery by preventing the white corrosion material from forming on the posts. When this white corrosion appears on your battery terminals it exponentially reduces the charge to the battery and from the battery to your engine. This excessive corrosion resistance formation will shorten your battery life. To ensure good starts throughout the year, the condition of your battery posts (keeping them free of corrosion) is as important as changing your car's oil. Battery corrosion is a serious business, which is why most major industrial companies recommend the use of NO-OX-ID on backup battery systems and critical electrical connections. Industrial battery companies prefer NO-OX-ID for field applications because they cannot afford to replace battery cells due to overheating and failure from corrosion, and neither can you! Disconnect the connector from the terminal. When taking the battery out first disconnect the negative terminal (-), then disconnect the positive (+). Use a toothpick size steel wire brush to buff the face of the terminal post until the face is bright lead. Next, apply a light coating of NO-OX-ID A-Special to all four faces of the terminal post. Reattach the cables to the battery. When reattaching the battery, first connect the positive (+) connection then reattach the negative terminal (-). Stereo enthusiasts and hobbyists love NO-OX-ID... BECAUSE IT WORKS! NO-OX-ID A-Special works absolute wonders on audio connections, especially on those pesky RCA connectors that tend to corrode on the inner surfaces of the ground shell, 1/4 phone and even USB connectors. Tinning stranded wires destined for mechanical compression-type connectors defeats the purpose of the mechanical compression. When you insert a set of bare copper wires that are clean and protected with stuff like NO-OX-ID into a speaker thread-type compression connector, the resultant force of the compression on all the strands is what makes a good connection. Telephone companies have been using NO-OX-ID for seventy years. I have seen fifty-year-old NO-OX-ID on connectors that I've disassembled and the stuff is still goopy and the connections are still bright and shiny as the day they were made. 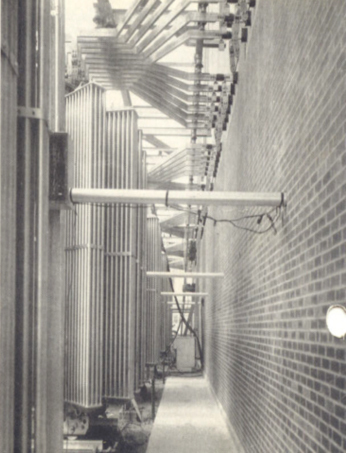 A quote from a Bell Systems manual on making a connection: "The mating surfaces of the connection shall be burnished to a bright metallic finish and coated with a thin layer of NO-OX-ID anticorrosion paste to preserve continuity indefinitely." One public utility states on its purchase orders: "This material is used in making aluminum to aluminum connections on outdoor High-Voltage Switchgear. PSO has tested dozens of joint compounds and none are equal to the Sanchem NO-OX-ID. Please procure this brand!" NO-OX-ID is a great product, a must, for any grounding application. One major engineering company recommends the use of NO-OX-ID on Track & Positioning pins on 480 volt drawout breakers (Circuit Breakers). Review from an Electronics AF and RF engineer - "Electronics, both AF and RF, have been my employer and hobby since 1963. NO-OX-ID preserves the conductive finish. I use it on all AF and low frequency (Below 30MHz) RF connectors and have never had a glitch because of its presence. The ideal amount of NO-OX-ID to use is one molecule thick. No gobs. If a person takes care to wipe off excess with a clean paper towel the residue, barely seen, even, is plenty enough to forestall corrosion. I even use the stuff on gold-plated edge connectors on circuit cards. I own an old Yamaha DSP-A100 integrated 5.1 rig that CircuitCity sold for $50.00 because after it sat around being demo'd the interior flat ribbon cable connections corroded and the amp lost its snot, so to speak. It took fifty hours of repairs, taking it completely apart and burnishing the non-soldered connections, but it worked. (I attended the Panasonic Technical schools for Digital Electronic, Broadcast and Computer Repair and that's where I learned of the built-in obsolescence that non-soldered connections afford.) Even the expensive microprocessor chips that plug in to receptacles decline in conductivity over time, except when protected by NO-OX-ID, so as soon as I purchase a piece of equipment I yank it apart and goop up the non-solderables 'cause I know they're ticking bombs." Gary is a Model Railroad Train enthusiast: "I applied the NO-OX-ID to my layout 4 years ago, and have experienced skip free running ever since. This is even after periods of no running for as long as a month. I HAVE NOT CLEANED MY TRACK IN 4 YEARS! An added bonus, is that the NO-OX-ID has changed my loco wheels into better conductors, as I have not had to clean them either." Battery terminal grease for model drones and UAVs. Used on drones for electrical contact lubricant. NO-OX-ID A-Special Electrical is the conductive grease compound and rust preventive that prevents corrosion and lubricates electrical connections. Other NO-OX-ID electrically conductive grease and conductive lubricants include NO-OX-ID: "A", "A-Special 200" & "E". Toxicity: All NO-OX-ID products are produced from pure virgin clean raw materials and are RoHS compliant. That is why NO-OX-ID A-Special has received health certification from the EPA under NSF-Std 61 for use in drinking water tanks and is USDA approved as an electrical contact grease and general lubricant for meat & poultry plants. Your electrical connections need rust preventive electrical grease that is a conductive lubricant to prevent rust and corrosion from causing a costly terminal grease connection failure.